For kids and adults with food allergies, a restaurant outing can be a fraught experience. Even when care is taken, freshly prepared or packaged meals can accidentally become cross-contaminated with an offending food and trigger a reaction. Now researchers report in the journal ACS Nano the development of a new portable allergen-detection system — including a keychain analyzer — that could help prevent trips to the emergency room. Most people with food allergies manage their condition by avoiding the specific nuts, fish, eggs or other products that cause a reaction, which can range from a mild rash to life-threatening anaphylaxis. But avoidance isn't always possible because food can be mislabeled or cross-contaminated. Conventional methods to detect these hidden triggers either require bulky laboratory equipment, or are slow and don't pick up on low concentrations. Ralph Weissleder, Hakho Lee and colleagues wanted to make a more practical, consumer-friendly option. The researchers developed a $40 portable allergen-detection system called integrated exogenous antigen testing, or iEAT. 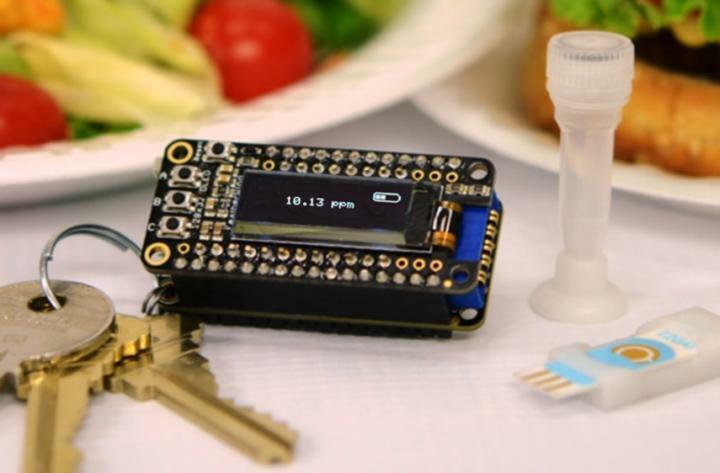 It consists of a handheld device to extract allergens from food and an electronic keychain reader for sensing allergens that wirelessly communicates the results to a smartphone. In less than 10 minutes, the prototype could detect five allergens, one each from wheat, peanuts, hazelnuts, milk and egg whites, at levels even lower than the gold standard laboratory assay. Testing on samples of menu items from restaurants showed some allergens in unexpected dishes and beverages — for example, gluten in salad and an egg protein in beer. Although the prototype was designed to sense five allergens, the researchers say the device could be expanded to test for additional compounds, including other allergens and non-food contaminants such as pesticides. The authors acknowledge funding from the National Institutes of Health and Taiwan's Ministry of Science and Technology Postdoctoral Research Abroad Program. The abstract that accompanies this study is available here. The American Chemical Society, the world's largest scientific society, is a not-for-profit organization chartered by the U.S. Congress. ACS is a global leader in providing access to chemistry-related information and research through its multiple databases, peer-reviewed journals and scientific conferences. ACS does not conduct research, but publishes and publicizes peer-reviewed scientific studies. Its main offices are in Washington, D.C., and Columbus, Ohio.